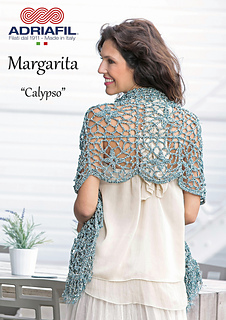 Materials: Adriafil Margarita petrole blue (65) 8 –10 – 12 balls, crochet hook: 4,5 mm (US7-UK7), a yarn needle. Tension: 24 sts and 6,5 rounds = 10 x 10 cm (4x4”) using Treble crochet. S/M: 48 cm x 138 cm (18 7/8” x 54 3/8”) without fringe. M/L: 48 cm x 168 cm (18 7/8” x 66 1/4“) without fringe. L/XL: 48 cm x 198 cm (18 7/8” x 78”) without fringe.